This website refers to blank versions of products in Pacesetter Awards' 2014 Catalog. Most items ship within 24 hours. For imprinted/custom items, please call a PaceBlanks Customer Service Representative at 888-545-1933 for additional information. 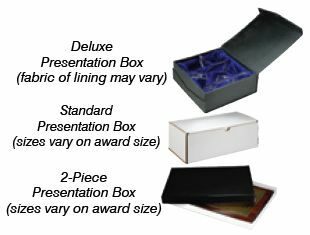 Packaging: Products packaged in presentation boxes are indicated on appropriate pages. All other products are packaged in foam pouches, poly bags or shrink-wrapped. Contact factory for special packaging needs. Shipping: All orders are FOB: Chicago, IL. Orders without prepayment or credit approvalwill be shipped COD. Factory ships via FedEx or UPS. Any other method of shipping or international shipments will be subject to an additional Document Charge (DOC): $15.00 per destination. For each incorrect shipping address provided, an $7.00 Address Correction Handling charge (FRTCOR) will be billed in additionto the charges we incur from our shippers (FRTADDL). Credit Card Declines: A $15.00 fee (CCDECLINE) will be billed. Third Party Shipping/Freight Collect: Available upon request - customer must supply account number, telephone number and reference number on purchase order at least 3 days prior to shipping. A $10.00 (TPS) charge will be applied per order. Lost or Damaged Merchandise: Claims for repair, replacement, corrections or shortages must be presented to our company within 7 days from receipt of the shipment. Re-shipment, if necessary, requires the use of professional care and packaging materials to prevent damage in transit. Return Policy: All samples or packages must be approved prior to returning them to the factory. Please contact Customer Service for a return authorization number (RA #). Delivery will be refused for any return not bearing a factory-issued RA #. A 20% Restocking fee will be applied to all returns of stock catalog items. Custom, imprinted and non-stock items are non-refundable. Order Changes: Changes to orders must be faxed or emailed. Decreased or increased orders will be billed at the appropriate column price. Prices are F.O.B. Factory: Prices and items may be subject to change without notice due to the fluctuating market value and availability of raw materials. This catalog supersedes all previous catalog prices and items. Our company reserves the right to change prices, sizes, colors, materials or other standard product specifications without notice. Minimum Orders: Orders totaling less than $40.00 will incur a $15.00 (SMALL) order handling fee. In order for us to maintain the high level of service and assistance that we are known for, each order we handle goes through several administrative processes, pulling, packaging, double checking etc. To help offset these costs, along with the rising costs of packing and shipping supplies, a Minimum Order Charge is necessary. We encourage all customers to browse through our web site to add an item or two to exceed the minimum order amount and avoid this charge. Inventory: Every effort is made to maintain sufficient quantities to meet production demands - however all orders are subject to product availability. Please verify availability with Customer Service. Office Hours: Customer Service may be reached Monday through Friday 8:30 am to 5:00 pm CST. Guarantee: Your satisfaction is important to us. We guarantee replacement or refund of any products due to shipping damage, defect or factory error upon inspection of returned products, if they are returned within 30 days from receipt of the shipment. Some products have variations such as size, color, pattern and surface texture, which are considered characteristic of the product. No replacement or refund will be provided due solely to characteristic variations.